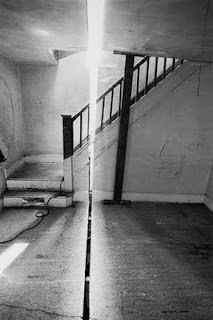 architectural ruminations: Gordon Matta-Clark at The Pulitzer ! The Pulitzer Foundation for the Arts will host the opening reception for its new exhibition, Urban Alchemy/Gordon Matta-Clark on Friday 30 October from 5 to 9pm. Gordon Matta-Clark. View of Splitting. 322 Humphrey Street, Englewood, New Jersey (1974). Saturday 31 October (from 10:00 am - 5:00 pm) will be the first full day the Gordon Matta-Clark exhibition will be open to the public. Please attend the opening on Friday. It may well prove to be the event of the year in the Saint Louis art community.